“You’re tearing me apart Lisa!”, a famous line that almost any aspiring filmmaker can quote. The Room captivates many viewers mostly based on its legendary name, but also because of its irreverence and dark comedy intertwined throughout the film. It’s pretty clear you’ve mastered a terrible film when moviegoers ask for refunds on their tickets only 30 minutes into show time. Or, when you must promote the film with a massive billboard in Hollywood attached with an RSVP phone number. Contrary to most debut filmmakers, Tommy didn’t want to be some exceptional filmmaker and producer. Fame was the ultimate goal for Tommy. He would do anything to achieve fame and become a real “star”. He set himself apart from the common norms of Hollywood in any way he could. I believe The Room channels a multitude of built up anger and emotions at movie ideals that just pours out over the screen. Every flaw seems almost purposeful. Every flaw would eventually make him famous and maybe on some level he realized this. The Room is quite revolutionary, not only because of the reputation as the worst movie of all time, but also because it was so unique. 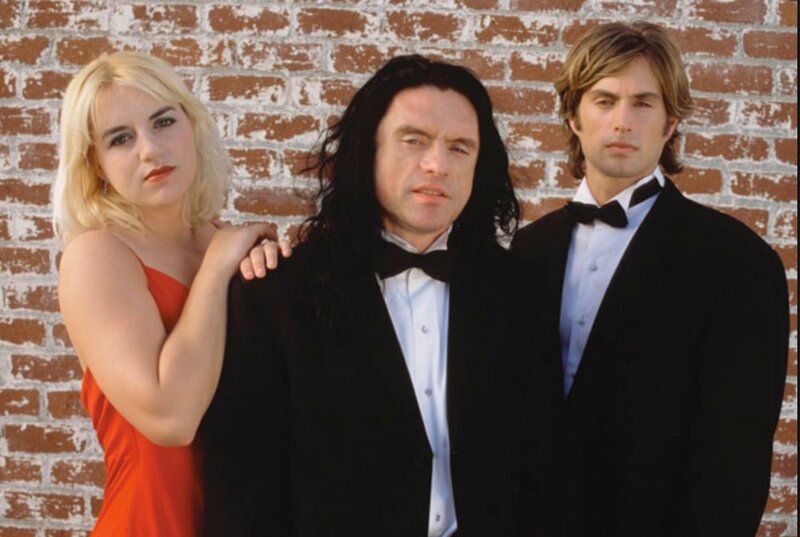 The film centers a love triangle between Johnny (Tommy Wiseau), his best friend Mark (Greg Sestero), and his fiancée Lisa (Juliette Danielle). It revolves around all 3 melodramatic characters mixed in with some insignificant subplots that don’t get resolved. About halfway through the film, it’s practically unwatchable. Between the jump cuts, the voiced over mess, and the indistinguishable puzzling Eastern European accent Tommy encompasses, it’s nearly impossible to look past the flaws. Ultimately it leads to a dramatic ending where Johnny realizes the level of betrayal Lisa committed, and he kills himself. Much of the plot is said to be a parallel to Tommy’s own life, but perhaps on a more dramatized level. While the plot itself is incoherent and irreverent, the theoretical groundwork of the film is what sets it apart. Tommy has stated that the title, The Room, insinuates the potential of one single room to be a place and culprit of both good and bad events. This could be a combination of loving his fiancée to eventually hating her for her actions. On a more psychological level, the “room” could be an allusion to each person’s life that holds all secrets and knowledge, but also the source in which relationships and friendships evolve from. For viewers, it poses a series of questions involving each person’s own personal “room”. What would inhibit that room? What relationships would evolve from your own room and how would these play out? It also has been described that the film is semi-autobiographical and attempts to serve as a warning about the vulnerability and risks of having friends. This would make for an absorbing personal connection to the film, and it appears that it was most likely made under these conditions. Despite The Room’s epic failure as a film, it’s received a great amount of fame in part because of Tommy Wiseau himself. Tommy is an enigma that puzzles and questions viewers to this day, which contributes to a portion of the fame. In addition, it has been the inspiration and roots for a recently released movie titled The Disaster Artist. The Disaster Artist is guided by The Room’s many mysteries, and attempts to give a closer look at the complications in understanding the film. The film delves deeper into both Tommy and Greg’s naïve lives, as well as the pre-production/production of the film. It brings a deeper appreciation and recognition to both new and old fans of the cult classic. It’s quirky and irreverent inspiration from The Room has led to a huge success across the board and has even achieved 2 golden globe nominations. With that said, The Room has not failed to inspire other movies amidst its disastrous (no pun intended) flaws. On behalf of all viewers of The Room, the infamous questions still stands. What were Tommy’s ultimate intentions with the film? What is that indistinguishable accent Tommy speaks with? And, why do the guys play football in tuxedos? Now, I’m definitely not saying this is great filmmaking by any means. However, if you think outside the box and search for a deeper meaning and significance, you just might see the uniqueness it holds.